This will be the last Daily Update until December 6th as my family and I are off for a small vacation to relax and do some shopping. We're going to do our best to help bolster the U.S. economy: three ladies and a guy who is known to enjoy shopping on ocassion equals hefty spending! 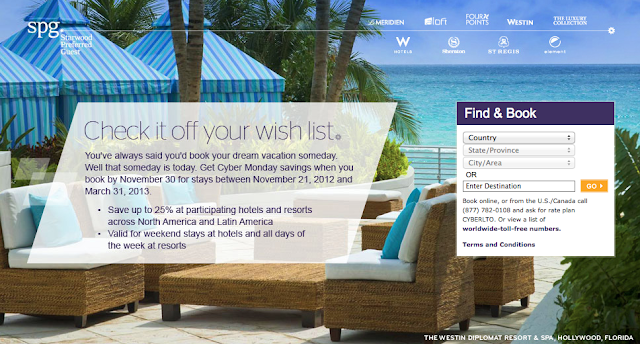 Melia International Mas rewards now offers an option to buy or gift Mas Points. To celebrate the launch they are offering a 20% bonus on all points purchased. The program allows you to buy up to 100,000 points before the bonus in a calendar year. I'm still looking at their redemption options to see if this can be worthwhile promo to take advantage of and will report back if there is anything that stands out. The winner of Rewards Canada's Cardswap.ca giveaway was @BremerVan Congratulations! Aeroplan and all Star Alliance partners welcomed the newest member to their fold, Shenzhen Airlines. Another option for you to earn and burn Aeroplan (and other *A) miles. The Alitalia MilleMiglia program is burdened by some obscure Italian law that makes it 're-invent' itself every few years and the 'current' version of MilleMiglia will end on December 31. This means members have until Jun 30, 13 to redeem their miles (usually Alitalia runs some sort of promo that allows you to keep or renew your miles) but if you are holding some and are afraid to lose them you can now redeem them for coupons that can be used towards future Alitalia flights. The coupons range in value from 100EUR to 4,000EUR with a cost of 17,000 to 400,000 MilleMiglia miles. The coupons are good for flights in all of 2013. More details can be found here. Redemption bookings for Saver Award flights in the Singapore Airlines Suites on board the Airbus A380 are now available. With the launch of this latest initiative, PPS Club and KrisFlyer members will have the choice and flexibility to redeem all award types in all cabin classes across the Singapore Airlines network. We will be revising our award charts to include the Singapore Airlines Suites, which will be categorised together with First Class award levels for ease of reference. Despite this change there will not be an increase in the current Saver Award levels for First Class. All Saver Awards are also now valid for one year instead of six months. There will, however, be an increase in selected Standard and Full Award levels for First Class which will also apply to the Singapore Airlines Suites. For members who have made a prior Standard or Full Award booking for First Class, the original award levels will be honoured for bookings made on or before 28 November 2012 and ticketed by 12 December 2012. Please contact KrisFlyer Membership Services for assistance. Please click here to view the revised award charts. Over the past 2 years my travels have been taking me to Toronto more often. 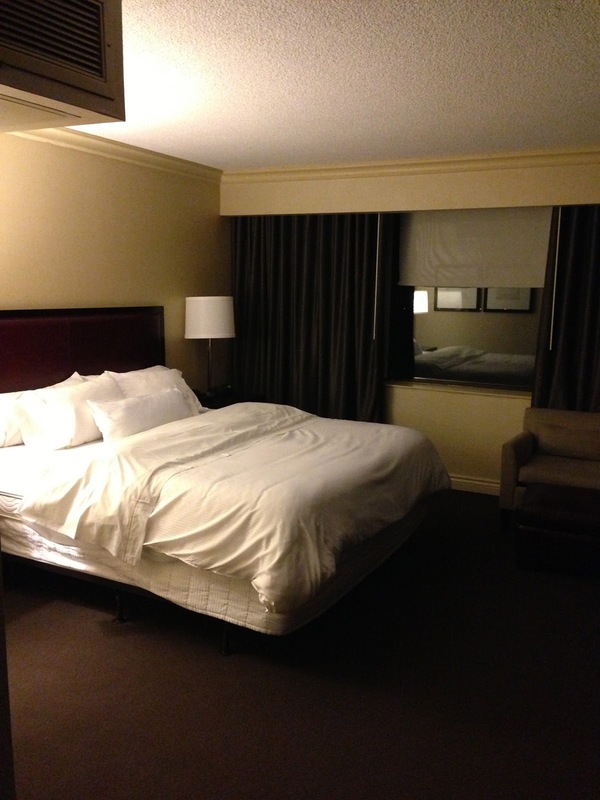 Since it is primarily for business I seem to be bouncing around hotels in YYZ per the demands wishes of my clients. 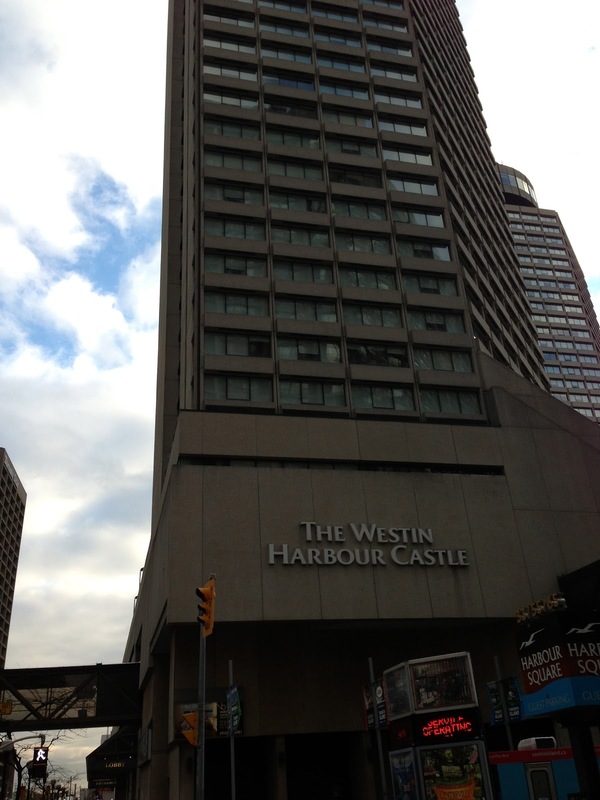 The latest trip which was for Aeroplan’s Media Day, (see the flight report here) had me staying for the first time at the Westin Harbour Castle Hotel The stay was paid for by Starwood Canada but surprisingly enough the rate they booked and paid awarded me Starpoints and also counted for the Better by the Night promotion. 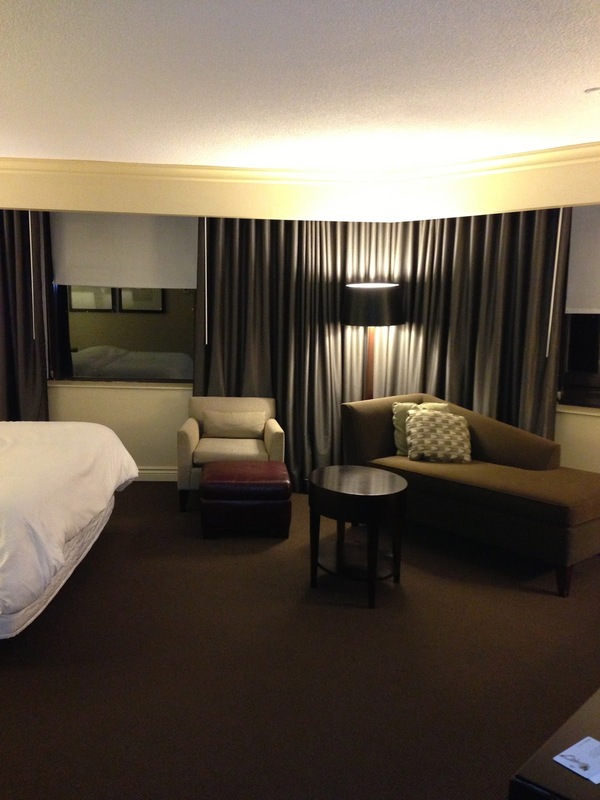 So I ended up with double Starpoints for this very short stay. It should also count for the Aeroplan Starwood promo that is currently being offered since that one is stackable. I will see how that comes out after my upcoming stay at the Westin Mission Hills Resort in Palm Springs next week. The room itself was quite large and it afforded a great view of the Harbourfront, Lake Ontario and the flight path for the Toronto Island Airport. Sorry ‘avgeeks’ I didn’t get any shots of the Porter or Air Canada Dash 8’s coming in to land! 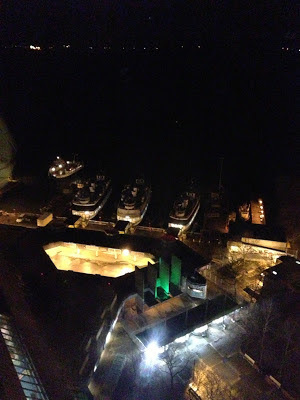 Here are some pics of the view at night and during the day testing out the panorama feature of my iPhone 5 for the first time. I didn’t spend too much time checking out the general areas of the hotel in the morning as I was on the hunt for breakfast off site. Once I got back to the hotel checkout was painless and 9 hours after checking in I was in a taxi on my way to Airship 37. 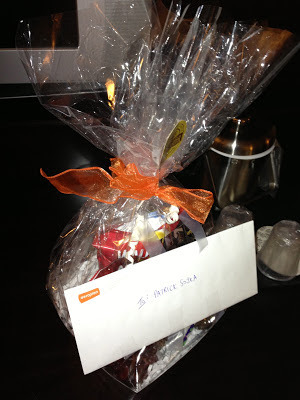 I don’t put too many of my flights up onto the Rewards Canada blog but I had some time to do this review of my quick turnaround for the Aeroplan Media Day held on November 13, 2012. Since I wasn’t planning on doing a review of the flight I unfortunately have no photos to post which will make this review even more boring since even I , when I read trip reports, like the photos the most! Anyways, Aeroplan contacted me back in October to see if I could attend their annual media day and this year my schedule allowed me to do so. It also helped that Aeroplan covered the flight costs and Starwood Canada covered the stay at the Westin (see my separate post on the stay). It’s hard to say no when your costs are covered! Although my schedule did allow me to attend, it was tight, so I requested flights out of YYC on the evening of the 12th and back on the 13th in the afternoon or evening. Aeroplan booked the flights not too far out so I figured it would cost them more miles than the basic 25,000 miles required for a Classic flight but when I saw my itinerary I was shocked (well not really) to see it cost them 108,000 Aeroplan Miles to get me on those flights. Personally I can think of a lot of better redemptions that 108,000 Aeroplan miles can be used for but I figure the actual accounting cost of those miles to Aeroplan would only run around $500-$800 so no different than what the flights would have cost to purchase straight from Air Canada. Still, for my family of four we could have got flights to Disneyland for that amount! But it is what it is. Aeroplan had put me into a middle seat around the middle of the plane so a few days before I changed my seat on the Air Canada iPhone app (I do really like this app) to a window seat towards the back as it was wide open and my hope was that no one would take the middle seat. I also changed my seat on the return flight towards the back. Now, I am different than many flyers out there. When I am not traveling up front and am in economy I like to be at the back of the plane. Typically I am in no rush to get off the plane so I like to board earlier to ensure I get overhead space as I do not check luggage for short trips like this but do take two carry-on bags. Plus I have found it more likely to get the middle seat empty at the back of the plane than in the ‘preferred’ economy seats in the middle of the plane. I got to YYC at quarter after four in the afternoon, an hour before departure and much to my surprise parkade #1 was slammed and I ended up parking on level 7. Never had that happen before but I attribute it to it being holiday Monday and being late in the afternoon. Most of my flights out of YYC tend to be morning or late at night (Red Eye to YYZ) so I have never had any issues parking on the lower levels. Luckily it didn’t add too much time for me to get to security which was light and I was through in less than 10 minutes and off to gate A10. My outbound flight was AC140 an Airbus A319, boarding was smooth, I got into my window seat and my gamble to get the middle seat empty paid off which meant my laptop bag went under the seat in front of that one allowing me to stretch my legs a little more. Although the plane left the gate on time, due to the high winds only runway 28 was in use and it was busy. 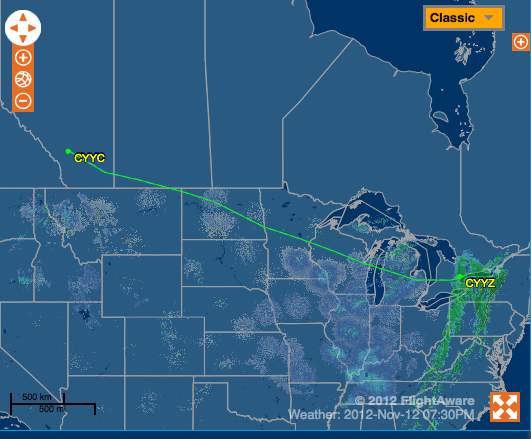 We had roughly a ten minute wait before being cleared for takeoff were airborne at 5:37 according to FlightAware. The flight was virtually uneventful, little to no turbulence allowing me to get a good amount of work done and fit in the second Sherlock Holmes movie. It’s nice to see the larger selection of movies being offered by AC now on their IFE system. The service from the flight attendants was good, none of them were grumpy as many people I talk to seem to encounter or experience from Air Canada. On approach to YYZ the captain came on the PA to announce that several flights ahead of us encountered severe turbulence around 13,000 feet, so we should be prepared for that. 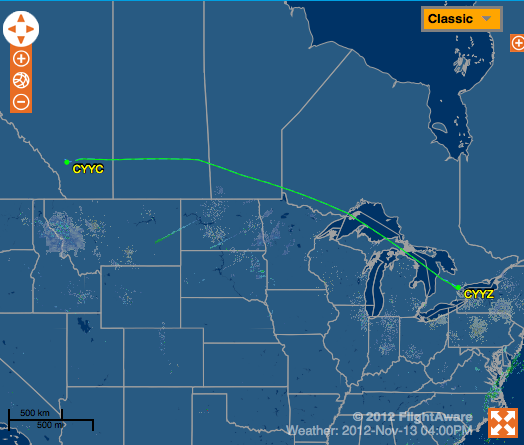 Luckily we encountered very little turbulence and the landing into Toronto was smooth and on time. The taxi to our gate was exceptionally quick compared to most of my flights into Pearson and I was in a taxi on the way to the Westin Harbour Castle by 11:25pm and at the hotel by 11:45 or so. A little more than 12 hours later I was back at YYZ right after 12:00pm with the hope of getting onto one of the earlier YYC flights (2 or 4pm) as I was booked onto the 6:30pm flight. First I checked at the baggage drop off desks and the agent didn’t even look into the flights as I wasn’t the first to ask and that all the flights for the day were full. Well at that point that saved me the $75 change fee on the Aeroplan ticket but I figured I would try to see if I could get on standby at the gate for each of the flights. As much as I like relaxing in business class lounges (I had two choices this day, the Plaza Premium lounge with my Diners Club card or the Air Canada Maple Leaf lounge with a Maple Leaf lounge pass) I much rather get home sooner. Security wasn’t too bad for YYZ but definitely could have been faster had there been some people working the lane I was sent to. I wanted to get to the gate of the 2pm YYC flight as soon as possible to see if I could get on that flight and there were CATSA agents around but it didn’t seem like it mattered to them that people were waiting in my particular lane. After about 5 minutes they decided to get back to work and a translator was needed for the gentleman ahead of me so that took up some more time, thinking the more time I lose the more people would be asking for standby on the 2pm flight since the front end agent did state I wasn’t the first to ask. Once through the gate I made a beeline for gate D39 and of course no agents were there (the time was about 1pm). I did find agents at gate D41 for the 4pm flight and asked about changing my flights. The agent was helpful enough that she said normally there would be a change fee but since every flight was full and overbooked that if I could get onto an earlier one my seat on the 6:30 would open up for someone else, so she put me on the standby list for the 2pm flight. Just like my flight to YYZ, the actual flight AC125 on an Airbus A320 back to YYC was uneventful. Service from the flight attendants was fine except for having some water spilled on me by one of them, not a lot and thankfully it wasn’t the Clamato Juice in her other hand. Despite cramped quarters, the man sitting in the middle was quite big, and I don't mean fat, just a big man, I was able to get some work done for the websites and fit in a movie (The Descendants) and a few episodes of the Big Bang Theory.
. I was a little disappointed they didn't bring the carry on luggage to the jetway as WestJet had done on my only other flight where I had to gate check luggage. Can someone tell me, since this only the second time ever I had to gate check a carry on, was I lucky on that WestJet flight or is that WS's standard policy? Anyways it took the better part of 20 minutes to get my gate checked luggage on the baggage carousel and I was soon on my way home. And just an after thought, anyone else notice that the YYC parkade payment machines in the terminal don't seem to work half the time? Yup I ended up paying at the parkade exit. Alright so this isn’t much of a flight review as I actually don’t delve too much into the actual flights since most of the action happened on the ground but I hope you enjoyed it anyways! Aegean Miles&Bonus, the program that is famous for offering the easiest route Star Alliance Gold status is 10 years old and to celebrate they a running a contest where the person who guesses the closest amount of miles awarded by Aegean Miles&Bonus over its 10 year history will win Businesss Class tickets and hotel stays. More details can be found here. There is another instant/free Accor Platinum Status offer floating around when you register your Le Club number or join Le Club via this link. 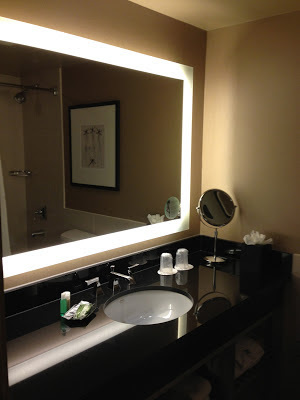 These Accor Platinum offers tend to be pulled pretty quick so be sure to sign up for it ASAP. If and when you get your status don't forget to use it for a status match from Best Western and possibly even Carlson Hotels Club Carlson. If you are planning any travels to Seoul check out my City Bonus Highlight for ICN over on the Frequent Flyer Bonuses blog. Receive a $50 Prepaid Visa when you stay any two consecutive nights at any InterContinental® Hotels and Resorts, Crowne Plaza® Hotels and Resorts, Hotel Indigo®, Holiday Inn®, Holiday Inn Express®, Staybridge Suites® or Candlewood Suites® hotel in Canada. Full details, online registration and booking. If you are a fan of CBC's Dragon's Den, you may recall this company, if not don't fret here is a YouTube vid of their appearance on the show. CardSwap.ca is a company that allows Canadians to buy and sell gift cards. At the time of the Dragons Den appearance CardSwap ran a different business model than they do now. I actually took advantage of CardSwap once by selling them a Brick Gift Card I won in a local lottery and would never use. The card was worth $100 and they paid me $74 for it. Sure I lost out on the value but that is why CardSwap is around, so that you can get something instead of nothing if you were not planning on using the gift card. CardSwap would then turn around and sell the card below face value but higher than what they bought it off me at. That is where the company made its money, the difference between the purchase and sale price of the gift card. The initial marketing stated you could save up to 40% versus buying the gift card at the actual retailer or any place that sold the cards. By selling them below face value they hoped to attract the many frugal Canadians looking to get a deal. Fast forward to 2012 and CardSwap has changed their business model into one that focuses more on a loyalty program rather than a straight discount. Which is why they are being featured here today, because of their CardSwap SwapPoints program. Instead of gift cards being sold at a discount on CardSwap they are now sold at face value. Wait a minute why would someone go the CardSwap and pay face value for a gift card when they can get them on their day to day travels to various stores? That’s where the new SwapPoints program comes in. When you buy a gift card from CardSwap you are awarded SwapPoints for that purchase. The amount of points you earn depends on what CardSwap paid for the card and what margin they want to get for the sale of the card. Looking through the site it looks like you get the equivalent of 2% to 10% of most of your gift card purchases back in SwapPoints but I did even see one card even coming in at almost 42%. The return is all dependent on the value of the card and who the retailer is. Those SwapPoints can then be redeemed for other gift cards, prepaid Visa Cards and even cash into your PayPal account. The standard redemption rate runs is 1,000 SwapPoints = $10 and 1,000 points is the minimum redemption amount. Typically this means you will have to make several gift card purchases from CardSwap before you start seeing a return. Frances Ho, one of the founders of CardSwap explained to me that most people will need to spend between $100 and $300 to get to the 1,000 point level. Before the change in their business model it didn’t matter whether you purchased 1 gift card or 10 gift cards, you saw the savings right away as those cards were bought at a discount. As an entrepreneur and business major I had a hard time at first getting my head around the change CardSwap did with their business model because it could drive away one time buyers and first time buyers who are unsure if they would return for another purchase. As a loyalty consultant, I can understand from their end why they would make the change however. First is the term ‘loyalty’, they want people coming back to use their service so by moving to a points system they are hoping to encourage people to keep returning so they can build up enough of a balance to redeem. As is seen with any loyalty program another reason you go to a points or miles based system is that you bank on breakage. In the loyalty world, Breakage is the number of points or miles that go unredeemed and are lost by program members either through account inactivity or point/mile expiration. Depending on the industry, typical breakage rates that loyalty programs try to achieve run between 10 and 25%. Is SwapPoints a worthwhile program? Absolutely, for the right type of person. If you are someone who regularly buys gift cards for yourself or as gifts then you should definitely utilize the CardSwap avenue. You will see savings on your gift card purchases once you start building up your SwapPoints balance and using those points either for more gift cards, the prepaid Visa cards or cash via PayPal. At this time, CardSwap is offering $5 for free when you join their SwapPoints program so it is entirely possible that you could reach the 1,000 or $10 level with only one purchase of the right gift card. Of course there is always the other side of CardSwap, but it doesn’t have anything to do with loyalty and that is the selling of gift cards to them. It is only fair to mention it however as it is vehicle behind the purchasing side of CardSwap. Essentially what happens is if you have an unwanted gift card you contact CardSwap with the retailer name and value and they will get back to you with an offer. If you accept the offer they will provide you a prepaid shipping label to send the card in and once they receive the card and confirm it is valid they will send you a cheque or credit your account with SwapPoints. In conclusion, if you are someone who regularly buys gift cards then there is no reason you shouldn't sign up for CardSwap. However if you are like me and only buy gift cards once a year or even less then the process of signing up for Card Swap and earning some points that will never be used won't be worth it since you are still paying face value for the card and you have to wait for it to be shipped out. I would rather take advantage of bonus Air Miles or Club Sobeys Points (hence Aeroplan Miles) offers from places like Safeway or Sobeys when they are occasionally run, not to mention the fact that if I buy those cards from a grocery store I'll earn double Membership Rewards points on my American Express Gold Rewards Card. Now, to the fun part! CardSwap offered me a $100 credit to try their site out but I am not much of gift card person and I asked Frances if I could instead offer it to one my Rewards Canada readers. She agreed and here is what you have to do to be entered to win the $100 CardSwap credit. I'm back to doing a full week of work on Rewards Canada. Watch for tons of bonuses, some news, some tips and another giveaway! On the news front the headline in the Canadian Travel Rewards scene is the return of Aeroplan's bonus for converting/transferring points from other programs into Aeroplan. See my post from earilier today for more details. On the tips front, if you are an American Airlines or United Airline elite status member you can get yourself an elite status match in Virgin America's Elevate program. See my post from earilier today for more details. And as I mentioned above, it's been awhile since I ran a giveaway on Rewards Canada (the last was the BW Gift Card). All I tell you at this time is that it will be run on Twitter, so be sure to follow Rewards Canada on Twitter! Labels: Air Canada Aeroplan, Alaska Airlines Mileage Plan, Virgin America Elevate. - A copy or screenshot of your most recent mileage summary showing your name and current elite level. - Or, a copy of your membership card that identifies your name and current elite level in the United Air Lines or American Airlines frequent flyer program. Labels: American AAdvantage, United Mileage Plus, Virgin America Elevate. Aeroplan is once again resurrecting their partner transfer bonus that we saw this spring. The latest in their slew of offers is the return of their partner transfer bonus. 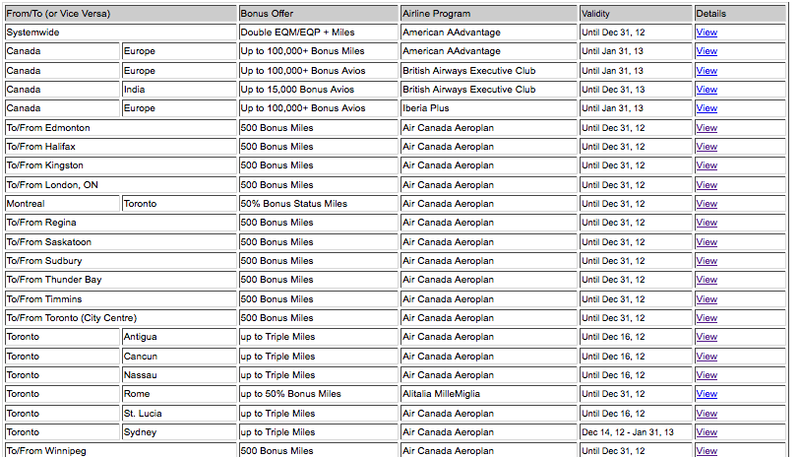 Basically what it entails is transferring points out of other select loyalty programs into your Aeroplan account. Just like we saw in May, the offer is once again cumulative across all participating partners. 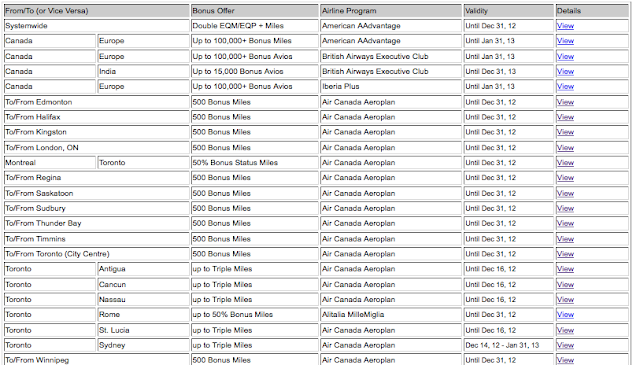 That is, you can transfer from partners like CIBC, Starwood, Hertz and more (see the last graphic) and as long as the total Aeroplan miles deposited from all of them reaches one of the bonus target levels you will be awarded the respective bonus miles. I did notice that this time the offer seems to target U.S. Credit Card holders save for CIBC in Canada as Bank of America and Diners Club Club Rewards are included. Of course all of the other hotel, car rental and Points.com partners are available to us Canadians. Unfortunately for me I like this promotion when American Express Membership Rewards is included but this time it is not, so chances are I will not use the promo this time.